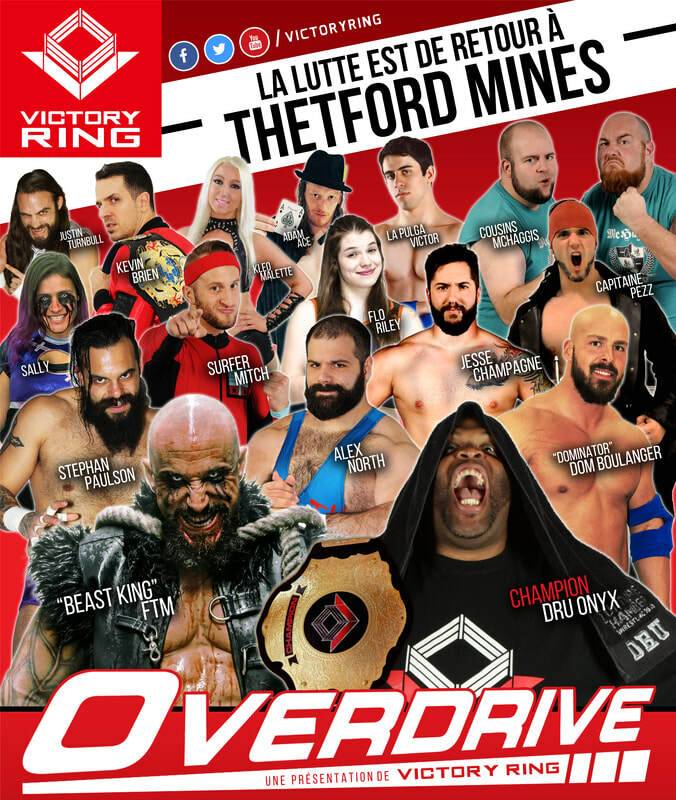 OVERDRIVE: LA LUTTE EST DE RETOUR À THETFORD MINES! / WRESTLING RETURNS TO THETFORD MINES! - Surfer Mitch et Jesse Champagne se rendent à la limite de temps. Champagne refuse la demande de Mitch pour 5 minutes supplémentaires. - Flo Riley bat Kleo Mallette, est ensuite attaquée par Sally. - Kevin Brien conserve le championnat Mi-Lourds Commonwealth contre Adam Ace, Justin Turnbull et La Pulga Victor. - Team Tight battent Qazi Awan et Mike Marston. Marston s'en prend à son partenaire après le combat. - Beast King FTM remporte le combat contre Dru Onyx par disqualification après l'interférence de Mike Marston. Dom Boulanger est ensuite intervenu pour repousser Onyx et Marston. Le défi est lancé pour RISE OR FALL le 24 novembre: Boulanger et FTM contre Marston et Onyx en finale! - Surfer Mitch et Jesse Champagne ends in a time limit draw. Champagne refuses Mitch's request for an extra five minutes. - Flo Riley def. Kleo Mallette, is attacked by Sally from behind after the match. - Kevin Brien retains the Commonwealth Cruiserweight championship against Adam Ace, Justin Turnbull et La Pulga Victor. - Team Tight defeats Qazi Awan and Mike Marston. Marston then turned on and assaulted his partner after the match. - Beast King FTM def. Dru Onyx by disqualification after interference from Mike Marston. Dom Boulanger then intervened to help fight off both Marston and Onyx. A challenge was issued for RISE OR FALL on November 24th: Boulanger et FTM will face Marston et Onyx in the main event! En ouverture de VICTORY RING: OVERDRIVE, la vedette montante "Dominator" Dom Boulanger a affronté le tout premier champion de VICTORY RING, Alex North! Ce dernier a adopté une nouvelle attitude, faisant preuve de mépris pour son adversaire ainsi que la foule de Thetford Mines. Ce fut Boulanger qui eut le dernier mot cependant, en remportant la victoire au grand plaisir des fans en assistance! ​In the opening of VICTORY RING: OVERDRIVE, rising star "Dominator" Dom Boulanger took on the very first VICTORY RING champion, Alex North, who displayed nothing but contempt for his opponent as well as the Thetford Mines crowd. It was Boulanger who got the last word however, earning the win to the delight of the fans in attendance! La ténébreuse Sally qui a fermé le rideau sur Angie Skye, en lui crachant son poison mist au visage! The darkling Sally closed the curtain on Angie Skye after spitting her poison mist in her face!